Offering the perfect complement to your contemporary kitchen, the Amish Kirkland Swivel Bar Stool steps up to the bar in style. This modern bar stool features a cut out rectangular shape in the crown of the stool that will draw interest as it offers a supportive seat. The base of the Kirkland features clean lines and the smooth form of a contemporary design. The Kirkland will add a modern accent to your kitchen furniture collection and is sure to make an impression as guests enter your kitchen. Enjoy meals, snacks and home projects seated comfortably in the Kirkland. 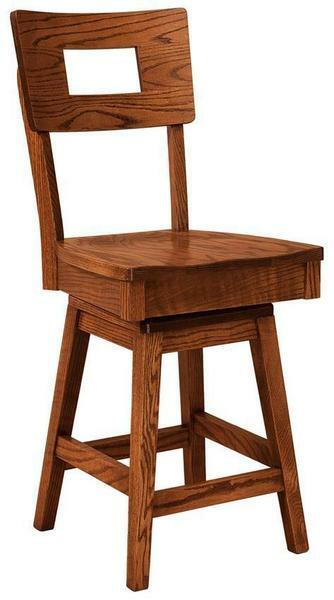 We offer the matching Kirkland Stationary Bar Stool as well as the Kirkland Dining Chair. Bar stool seating remains a popular choice for your game room and crafting room as well. Be sure to check out our blog post, Beyond the Bar: Other Uses for Bar Stools for more ideas for bar stool seating throughout your home. Enjoy the swivel action in the seat in your Kirkland Bar Stools. 30% down is all that's required to start your order. Call us today at 866-272-6773 or drop into our Amish furniture store in Florida.